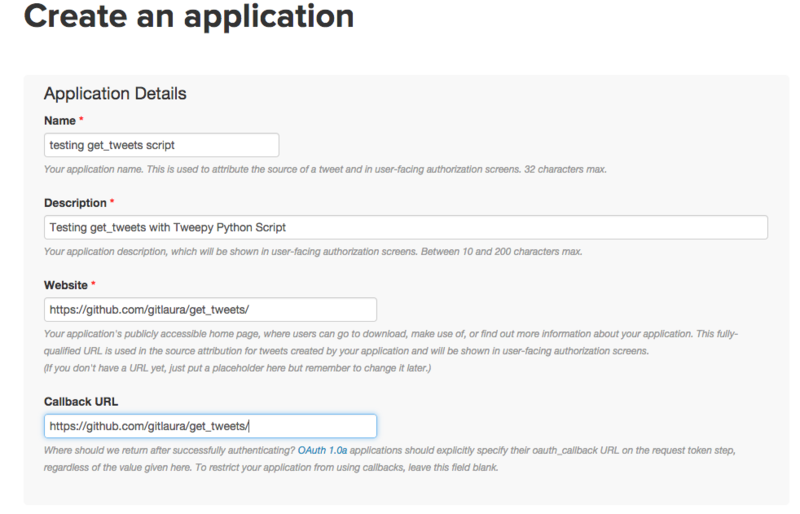 I’m excited to share a step-by-step guide to set up a python script that allows you to download any Twitter user’s tweets. This is a good first script or a tutorial for using an API since Tweepy makes this really easy. Go to developer.twitter.com and create a new application. It should look like this. If all went well, you should have just created a Twitter application. Next, click on the ‘Keys And Access Tokens’ tab. At the top you’ll see your consumer tokens. Scroll to the bottom and click ‘Create my access token’. Tweepy powers this script. If you haven’t installed it before you need to install it. You can use this command if you use pip. Open up get_tweets.py in your text editor. In lines 11-15 you need to replace the placeholder text with your new Twitter Application API keys. Number of tweets: I built this script to get the last 100 tweets a user sent. If you want to change that number, you can set the variable ‘number_of_tweets’ on line 25 equal to any number you want. Name of the new CSV file: You can create a csv file with whatever name you want. Edit this code outfile = username + “_tweets.csv“ on line 34. This entry was posted in API, Code, Python. Bookmark the permalink. Solid code, worked like a charm! Thanks for this wonderful explanation. Can you please help edit this to get all the tweets that show up on twitter with a particular hashtag? for example, this script lets me get all tweets published by an account like @realDonaldTrump. But, how can I edit it to get all tweets which contain #trump? Hi there, and many thanks for this tutorial. Unfortunately when I try to run the script I’m prompted with an error message, any idea what could be the issue? I’m using python 3.5. and thanks in advance for your help. I fixed this. Let me know if this is still a problem for you! After running the program where will the tweets be downloaded? Please reply to my email. You will create a csv file in the same folder at the python script. I just use the Terminal on my mac. Does that work for you? Do you have more resent instructions? I get an invalid syntax error on line 13 even though I do a straight copy/paste of the keys right from twitter apps/tokens tab. Is there an easier way to grab tweets now? these instructions are 5 years old. I just updated the script and the instructions. Let me know if it works for you now! I am using Python 2.7 so that may be the issue.